ATTLEBORO, Mass. 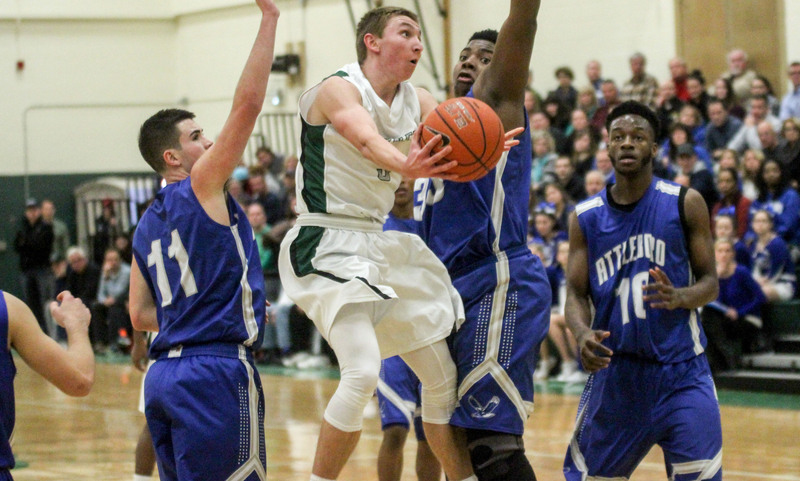 – The Attleboro boy’s basketball team wasted little time in flexing its offensive muscles against Dartmouth. 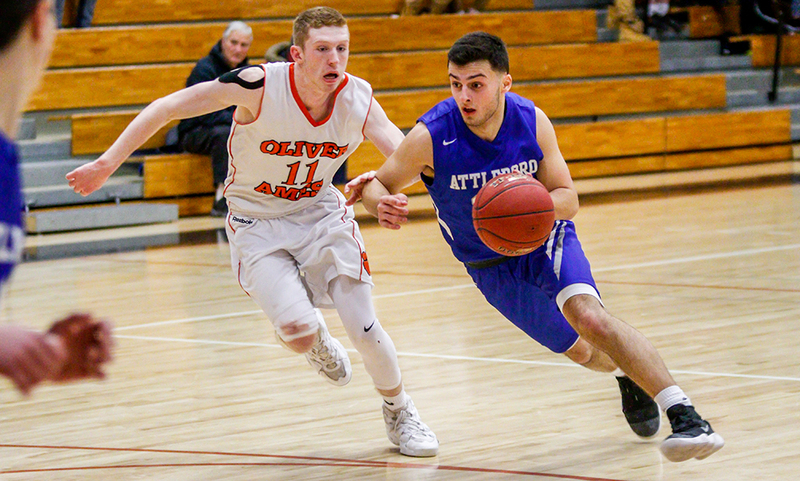 Bombardier sophomore Bryant Ciccio scored less than five seconds into the game off of the opening tip and then hit back-to-back threes, giving Attleboro an 8-0 lead just 1:13 into the game. 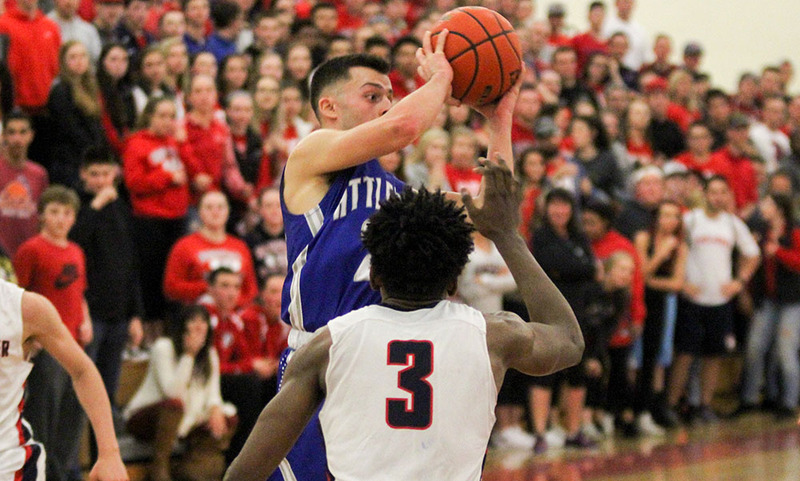 Attleboro went on another 8-0 run to start the second quarter, creating a double-digit lead that was never relinquished in a 72-44 win for the Indians. 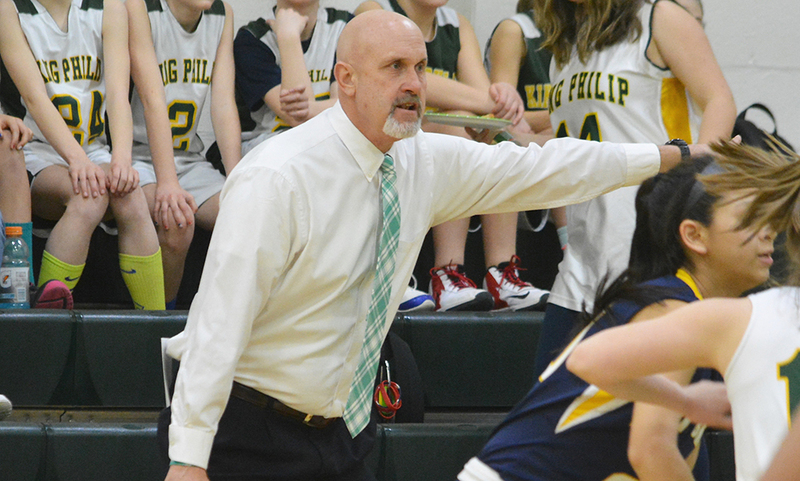 “In the game of basketball it’s those surges and runs that can make the difference,” said Attleboro head coach Mark Houle. “If you pile those back to back, you can really pull away. We went from a six-point lead to a 14 point lead, and once you get another one, you’re able to cut out any chance of a comeback. Dartmouth closed the first quarter strong to stay within two possessions (14-6) after eight minutes. But the separation came early in the second. Sophomore Qualeem Charles (eight points, seven rebounds) converted one of two free throws before sophomore Tim Callahan, fresh off the bench, came up with a steal and easy layup. After a miss, Charles came up with a big offensive rebound and putback and two possessions later, junior Mason Houle (eight points, three assists) drained a three off a feed from Ciccio to make it 22-8 with just over five minutes left in the third. Mason Houle banked a three from just over half court at the halftime buzzer, giving Attleboro its largest lead, 33-14, heading into the locker rooms. While the teams were level for the first four minutes of the third quarter, the Bombardiers put the game away with an 11-0 run over the next two minutes. Callahan (career-high 15 points) got it started with a triple, then came up with a steal for an easy layup. Ciccio forced another turnover and Nate Douglas (six points) hit a jumper. Ciccio then split the defense and hit a pull up jumper and Callahan capped the run with a strong take to the basket. Ciccio finished with a game-high 16 points along with three assists. 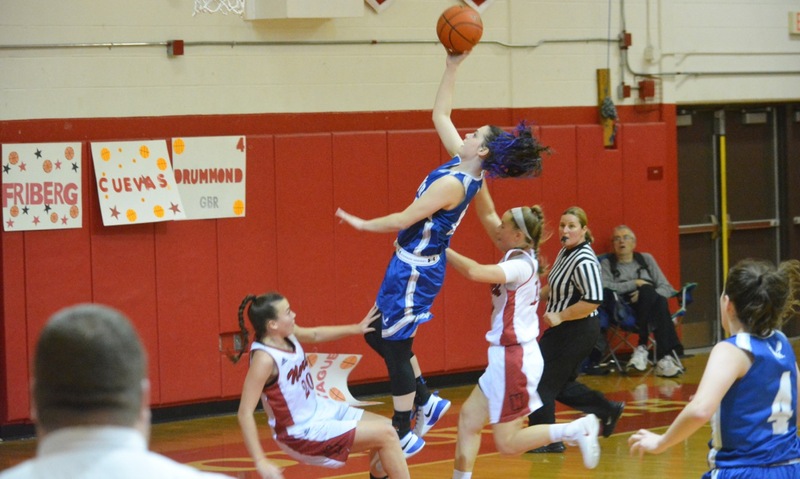 Attleboro shot 50% (27/54) from the floor overall and hit 12 of its 25 three-point attempts. It marked the third straight game that the Bombardiers hit double-digit threes, following 11 triples against Stoughton and 10 against Sharon. 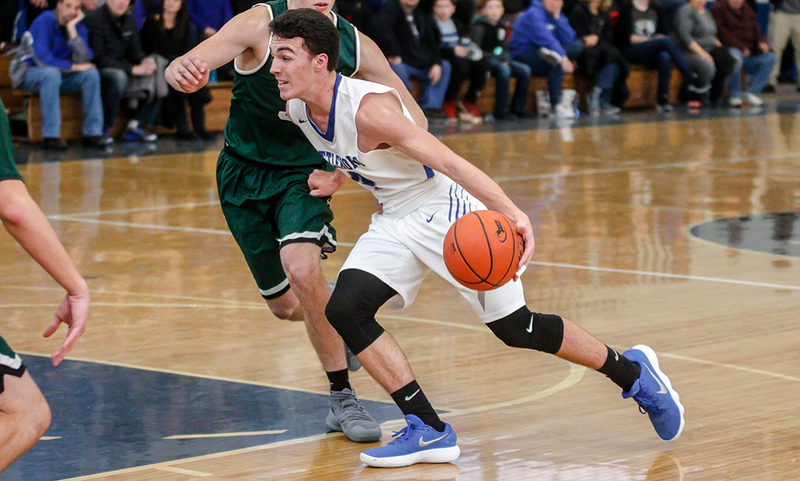 On Wednesday afternoon, five different Attleboro players connected for at least one three-pointer. Attleboro boys basketball (2-1 Hockomock, 3-1 overall) is back in action on Friday when it welcomes in-town rival Bishop Feehan at 6:30. MANSFIELD, Mass. – In typical Mansfield fashion, the Hornets moved the ball around the perimeter from player to player, eventually a pass finding its way to a wide-open Max Boen. The senior guard drilled the three-pointer, putting an exclamation point on a game-changing swing from the Hornets. 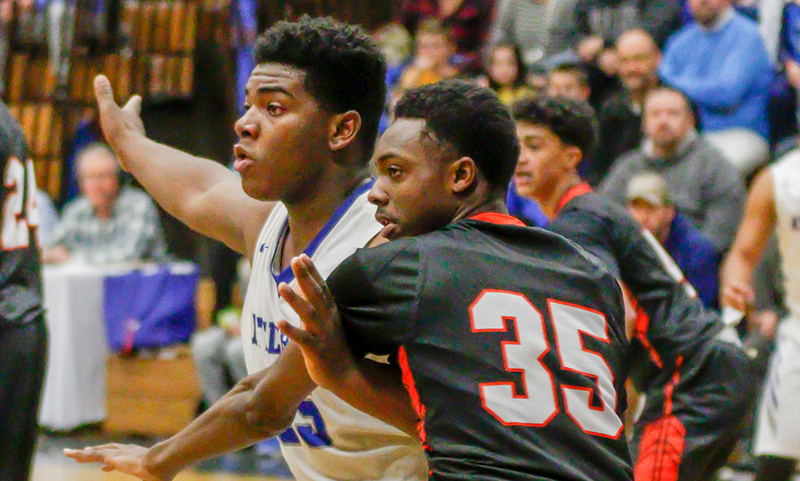 After holding a slim lead (22-21) at half, Mansfield rattled off an 11-0 run in the first three minutes of the second half to create the necessary separation for the rest of the way in a 54-49 win over previously unbeaten Attleboro. Sam Goldberg (15 points, nine rebounds) started the run with a putback, Tyler Boulter (eight points, three rebounds) added a layup, Christian Weber (13 points) drained a three and Boen (seven points, eight rebounds, three assists) hit a free throw before his big three. “I think we did a good job of wearing them out,” Mansfield coach Mike Vaughan said. 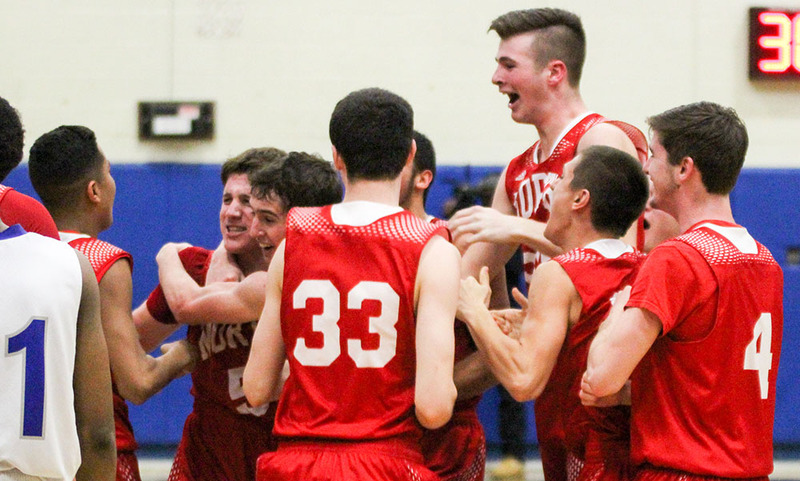 The Hornets stifled the previously undefeated Attleboro offense with a full court press for all 32 minutes. With scoring hard to come by for either side in the first, Mansfield opened the game with an inbound pass to Boen for an easy layup. Sam Hyland shadowed the Attleboro ball carrier all the way up the backcourt forcing a turnover, darting the other way to give the Hornets an early 4-0 lead. But as the first quarter dragged on, Attleboro settled in. Bombardier senior Jake Dunkley hit a three and added another bucket to spark the visitors, who trailed 10-7 at the conclusion of the first quarter. Dunkley (20 points carried Attleboro through a strong second quarter. He opened the frame with another three from the corner, then proceeded to work the post. He backed his defender down, pivoted and finished a fade away jumper. On the next Attleboro possession Dunkley drained another triple. After a basket from Berlyns Abraham (seven points, 10 rebounds), Attleboro had its lone lead of the game, 17-15. Mansfield stayed persistent in the third quarter not allowing Attleboro to diminish the Hornet’s 11-0 run. Goldberg and Weber each worked their way through the Bombardier defense and found their way to the room. Weber began at the top of the key, he stutter-stepped left, passed an Attleboro defender and finished with a right-hand layup. By the finish of the third quarter, Mansfield was up 41-30 — the difference equalling their run to open the half. 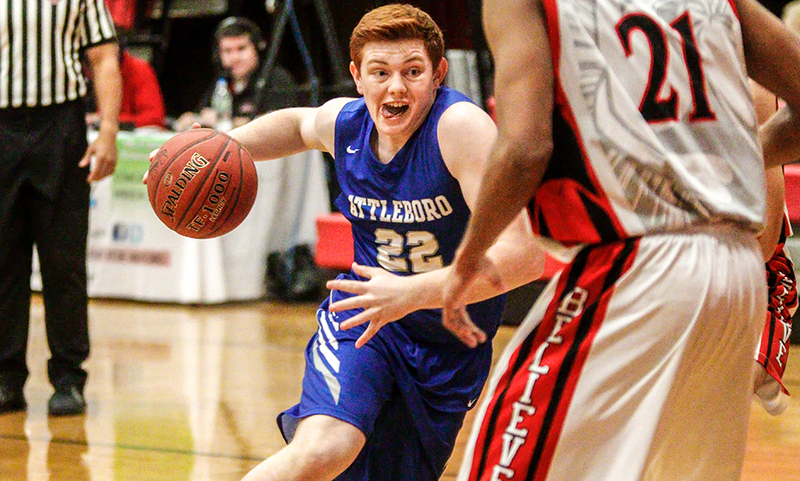 Attleboro lingered in the fourth quarter with Nate Douglas (seven rebounds) scoring seven of his nine points in the frame. The Bombardiers came within five points following a Dunkley basket and missed Mansfield free throws but the late surge was not enough as the Hornets closed the game out. Up next, Mansfield boys basketball (7-1) puts its undefeated league record on the line when it hosts rival Franklin on Friday at 6:30. Also on Friday, Attleboro (8-1) hosts Oliver Ames at 6:30. DARTMOUTH, Mass. – It’s not that the Attleboro Bombardiers played a bad first half by any stretch, it’s just that head coach Mark Houle knew his squad could play better. Behind a high pressure full court pressure, the Bombardiers used a dominate third quarter to make a somewhat close game into a rout, finishing the 2016 calendar year with a 78-40 win over Dartmouth. Attleboro forced 10 turnovers in the first half but held just a 29-21 lead at the break against Dartmouth’s zone. The Indians were even within two points with just over two minutes to play in the first half before an 8-2 run game the Bombardiers a bit of breathing room. The third quarter completely belonged to Big Blue. 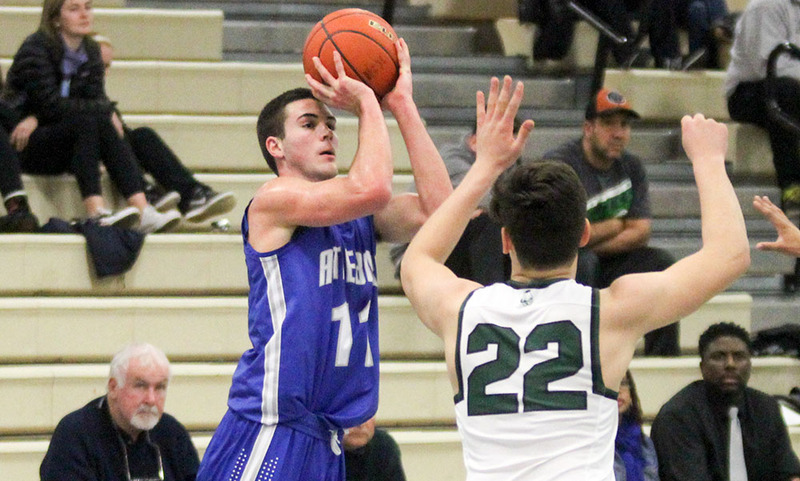 It took little time to see what kind of pace Attleboro wanted to play with as senior Jake Dunkley (19 points, six rebounds, five assists) hauled in a miss and went coast-to-coast for a layup. Attleboro forced five straight turnovers over the next two minutes, resulting in points each time. First, Andrew Milliken (17 points, four rebounds) drained a three off a feed from Dunkley. Nate Douglas got an easy layup and Berlyns Abraham converted a three point play after back-to-back mistakes from the Indians. Dunkley added a free throw and Douglas converted a three point play on Dartmouth’s fourth and fifth turnovers of the third quarter. Over the first 2:15 of the second half, Attleboro rattled off a 14-0 run to take a commanding 43-21 lead. After forcing 10 turnovers through the first 16 minutes of the game, Attleboro caused nine turnovers in a third quarter that they won 27-5. Adams did not score in the second half for Dartmouth. Dunkley added seven more points over the final four and a half minutes, accounting for 10 of his 19 in the quarter. Milliken scored 11 of his 17 points in the first half to pace Attleboro’s offense. Attleboro pulled its starters early in the fourth quarter and Houle was able to get all of his players in the game. All 12 players scored in the game, including seven points and three rebounds from Lucsas Boucicaut, six points from Elvin Sam and five points from Douglas. Sophomore Dom Victor and freshmen Bryant Ciccio and Qualeem Charles each scored four points apiece. “This is the first game that [Milliken’s] starting to hit some more since the first game,” Houle said. 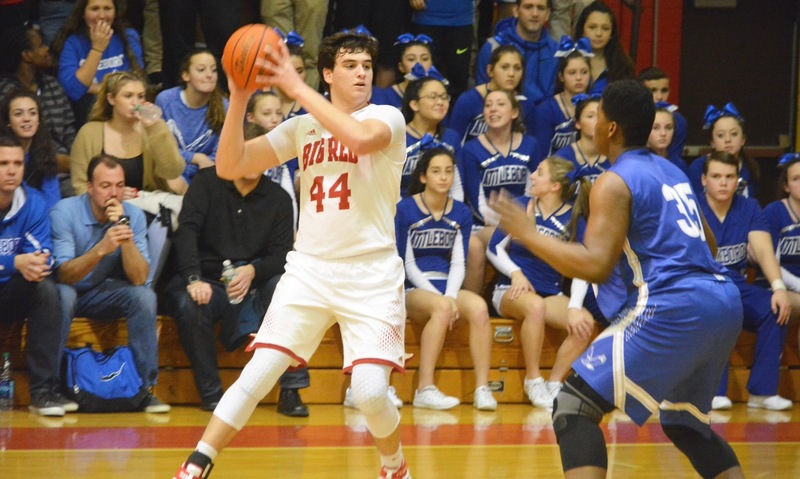 “He had 17 against Feehan but then he hit a little bit of a funk. Today was his second best game he’s had this year. When he’s hitting those outside shots, it opens up everything on the inside too. I think that was important. Attleboro boys basketball (6-0) returns to action on Tuesday, January 3rd, when it hosts Durfee in a non-league contest.